Every time I sit in the car and drive through the countryside I ask my self why don’t we make more use of our surroundings as an advertising tool? Everything from semi-permanent round hay bales to permanent structures can provide a home for communication.. For example, those hay bales just sit there and nobody really looks at them even though we all see them. Just imagine what they could look like – hamburgers, car tyres or even candy rolls. This is possible but the question is how? First you would need to have a solution to cover the large rolls with advertising media, say a plastic or a shrink wrap foil. But these are difficult to manage and a very large number of linear meters would be needed to get the results. Even then there is no guarantee that it would look good. 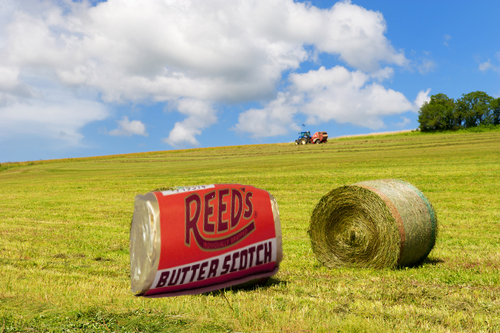 So in hindsight transforming the bales into an advertising campaign is not as easy as we thought. But wait there must be another solution? Let’s rethink how we could do this better, more reliably and cost effectively. One easy option is our always reliable self-adhesive PVC Vinyl. First it would be printed on a Solvent printer, as it is flexible and assures sufficient outdoor UV resistance to eliminate concerns about fading. Then we go to the location and apply it on one or more of the rolls. In my opinion the most effective way would be to have only one or two in a field. This would save on cost but keep the whoaa factor that it creates. The fun part is that this technology is available today, the price is reasonable, quick changeovers are possible and the advertising opportunities are great for a lot of products. And there is more that can be covered on the farmland. You could even go a step further and think about the coverings that are being used on barns and greenhouses. Using greenhouses as an example, most use glass but some use white plastics coverings or even polyester, and it would be possible to print these with different technologies. With this approach bigger sized advertising billboards in fields or around the farm could be a reality today. I have seen many greenhouses that are visible from the motorway so this must be an opportunity for advertising. 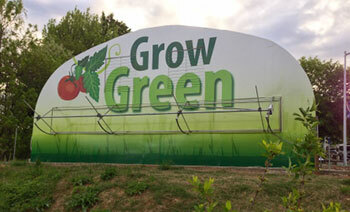 The production of these greenhouse projects is easy, as it is the same as large billboards. Multiple tiles can be printed and connected with each other to form one large image. Ideal media could be a thicker PVC Banner or a mesh banner for extra light. Of course you don’t want to use blackout banner media, as the plants inside would die. The standard finishing option is heat welded hems and grommets placed every 70-10cm around the banner perimeter. Additional finishing options include pole pockets, reinforced hems and reinforced corners – whatever is needed to keep it in place when the winds start blowing. Sometimes you can only use the side of the building because it is glass covered. In that case if you use the north side you will have a lot less fading than on the south side. So finding the right place and the product are the hard parts, the easy and fun bit is the production of the innovative advertising. How will you cover yours? NOTE: Covering static objects and building with images is not always possible with some European restrictions for this type of advertising. Please check what is possible in your area before starting printing.